This Spectre OEM replacement air filter is an easy to install performance option for the stock panel air filter in multiple Chevy and GM truck applications. With its HPR (High Performance Replacement) synthetic air filter media, this panel air filter has been designed to provide more horsepower and quicker acceleration by allowing more air flow into your engine than ordinary paper filters. 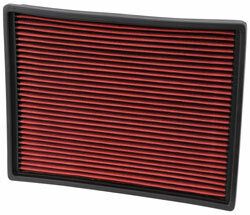 Engineered to fit in the stock air box, this air filter is easy to install and has been engineered with a sealing edge specific to your air box to insure a proper seal for great engine protection. The filter works great on my 2011 Silverado I notice more take off power and improve sound in the exhaust I also have one on my 1972 Chevelle 350 it works great also. So far it is working as advertised. I'll give it 5 stars for now as the filter has only been in the truck for a week...... the five stars reflect the price.